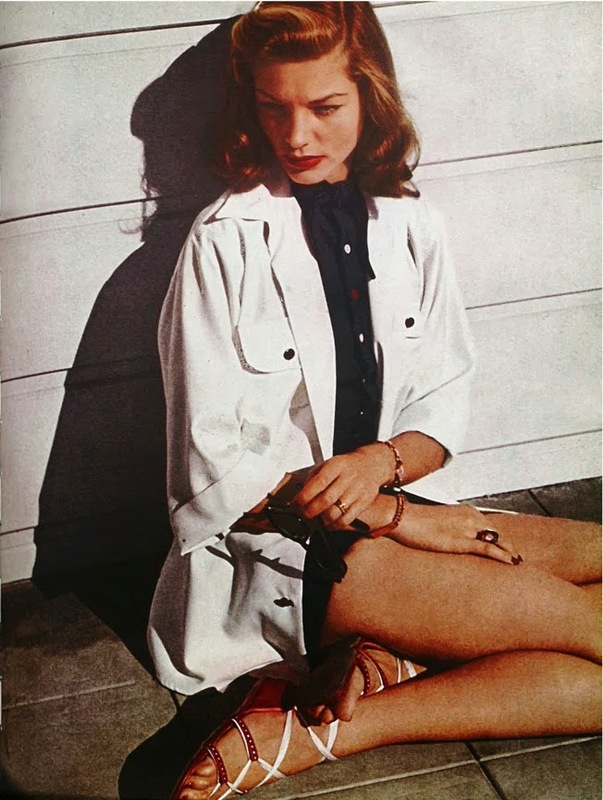 Lauren Bacall, the cinema and stage legend who died yesterday at age 89, was once the less enigmatic Betty Joan Perske, a New York girl with a lot of moxie. As a sixteen year old, she ventured downtown from her home on the Upper West Side (84th Street, under the elevated train) to look for work as a model and actress. In her great autobiography By Myself, she recounts her experiences as a teen model. Go back in time and take her valuable advice on how to make it in the cutthroat world of the Garment District in 1941! Plan your escape route: “The other girls seemed fairly uncomplicated to me — they would keep on modeling until Mr. Right came along and then they’d get married and be all set.” But Betty wanted to be an actress. On her lunch breaks, she would go up to Walgreen’s at 44th and Broadway. Then this happened. After six months she quit — “I was not getting any closer to the stage in the Garment District” — and eventually moved with her mother to 77 Bank Street in the West Village. This allowed her a full time foray into theater work, first as an usher, then as a extra and bit part player. But she still modeled for extra money, including a stint as a Montgomery Ward catalog model. Although would soon move on to full-time acting, her experience as a model was invaluable once she was put in front of a movie camera. Her cover work for Harper’s Bazaar even got her noticed by director Howard Hawks. Or, Bacall might have said, she did the best she could do with the face confronting her in the mirror.